Would you like some rubber stamping ideas? Rubber stamping is a lot of fun, but once you start buying stamps, it's hard to stop. What can you do with all your cool stamps and inks? Here are some quick ideas for things you can do with rubber stamps, and some great gift ideas, too. Here are some simple projects that you can make, often with materials and supplies that you already have on hand. Use your imagination to give each project a unique and personal twist. Use of bit of card stock to make a personalized bookmark to go with the thoughtful gift of a book your friend might enjoy or a gift card to her favorite bookstore. 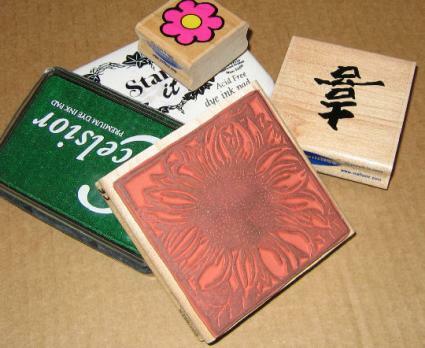 Consider the person's interests when selecting a stamp to use, or stamp her name, a flower motif or whatever you like. Color in the stamping or emboss the image if you have the tools. Punch a small hole with a decorative punch in the top center of the card, and slip through a ribbon, piece of yarn, velvet cording or a bit of leather to allow the bookmark to hang out of the book. Tie or loop the thread securely around the bookmark. Many people start rubber stamping to make their own greeting cards. You might have made your own birthday cards or thank you notes before, but have you ever thought about stamping your Christmas cards? You could buy a stamp with a wintry scene, hand-color the picture and write a short note inside. Handmade cards are more time-consuming than premade cards, but they are much more meaningful than something you just bought, signed and sent. As an alternative, consider making homemade cards as a gift for someone else. Stamp a set of small cards or plain stationery with the person's initials or a pretty scene that she will like. This is a particularly great idea as a gift for a friend or loved one who lives far away. You could even pre-address and stamp the envelopes so you'll be sure to hear back from them. Blank books with plain covers are available at many craft or paper supply stores. A great gift for the artist, writer or aspiring journalist in your life would be an appropriately sized blank book decorated with rubber stamps. You can either repeat one stamp across the cover several times or combine several different stamps with similar motifs to add interest. Again, you could stamp the person's name, use embossing powder to bring out a portion of the design, or just keep it simple with stamps and colored pencils or pastel chalks. Add a nice pen or pencil, tie the package up with pretty ribbon, and you have a great gift for any occasion. Wrapping paper or decorated gift bags are fun, creative ways to use rubber stamps. Buy plain white butcher's paper or brown craft paper or plain white sacks for gift bags, and decorate the paper according to the holiday or purpose of the gift. This is a great way to get kids involved in gift giving. They might not be able to pick out the gift or wrap it themselves, but they can decorate the wrapping paper. Give them markers, colored pencils, stickers, glitter and other fun decorative items, too. Using fabric paints, you can stamp on fabric, creating everything from T-shirts to place mats. A great idea for a holiday gathering is to stamp the place mats, napkins and table runner with different but harmonious stamps. You could even allow your guests to take their place mat home as a gift, or you could make a set of napkins or a pretty tablecloth as a holiday gift. Magnetic clear plastic picture frames can be purchased almost anywhere. Instead of putting another picture of your kids on the fridge, why not make rubber stamp magnets? Just stamp a piece of card stock cut to fit inside the frame. Add a border if you like, and color in as you desire. Then slide your creation into the frame and hang. The best part about this project is that the stamped part is protected from water splashes and other spills because it's under plastic. Again, these make great gifts. You could even combine stamping with a picture of your kids to make a great gift for Grandma. Rubber stamping is a popular hobby because of the wide variety of project ideas you can come up with. It can be just as much fun thinking up new ways to use your stamps as it is to create the items themselves. With a variety of different stamps, inks, paints, and supplies, the only limit to what you can make is your imagination.